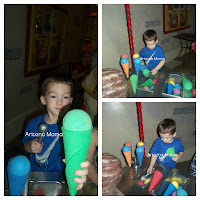 I had a day off work and so did my friend so we decided to take the boys to the Children's Museum of Phoenix. 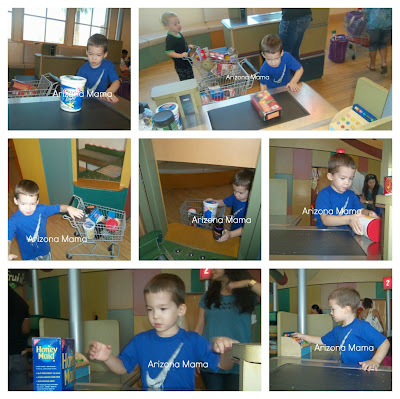 I really have been trying to spend a little extra time doing special things with Jayden and my friend had actually given Jayden money to go to the museum for his birthday. So this was a perfect day. The plan was to get up and get there when they open at 9.. we were a little later then that, more like 9:45 or so. But you know how that goes. The boys were so happy to see each other. 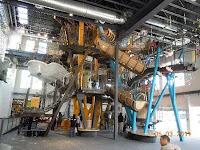 The first room is the giant tree house with all kinds of crazy stairs, tunnels, boats, and bath tub! Aidan took off to climb and go crazy. But conservative Jayen of course didn't want to go up, even if I went with him. But he has been up there before and it really is fun. 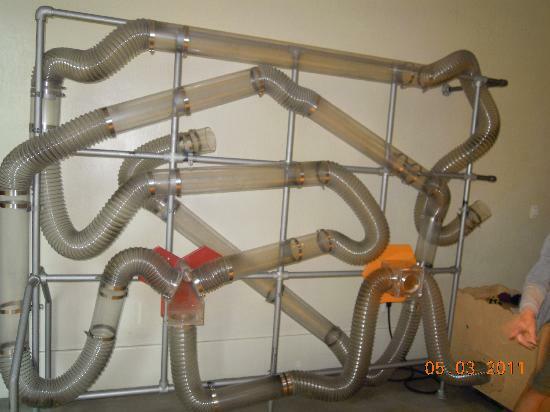 So instead Jayden wanted to play with the air tubes. 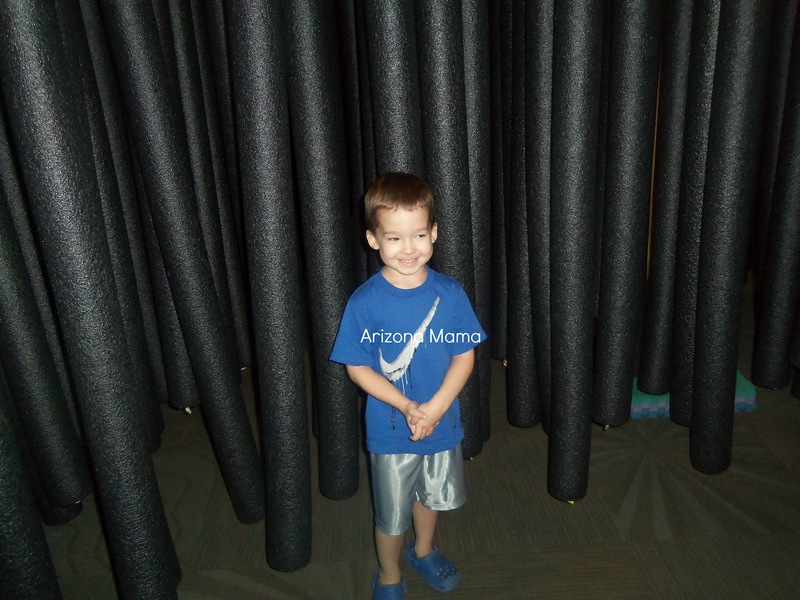 Jayden loved watching the wooden chip roll down. He would have stayed playing forever, but I was getting tired of standing there. I reminded him of the grocery store (his favorite room). And we moved on to go grocery shopping. When we got there the room was pretty full. It looked like all the grocery carts were taken, but after walking the room a little we found one that someone just left sitting there. So Jayden grabbed it up. He shopped and I had to check him out since there were not other children doing that job (every other time we have been there older children enjoy running the check out). Then Jayden had me shop and he checked me out. Aidan showed up to play for a bit, but soon left to another area. 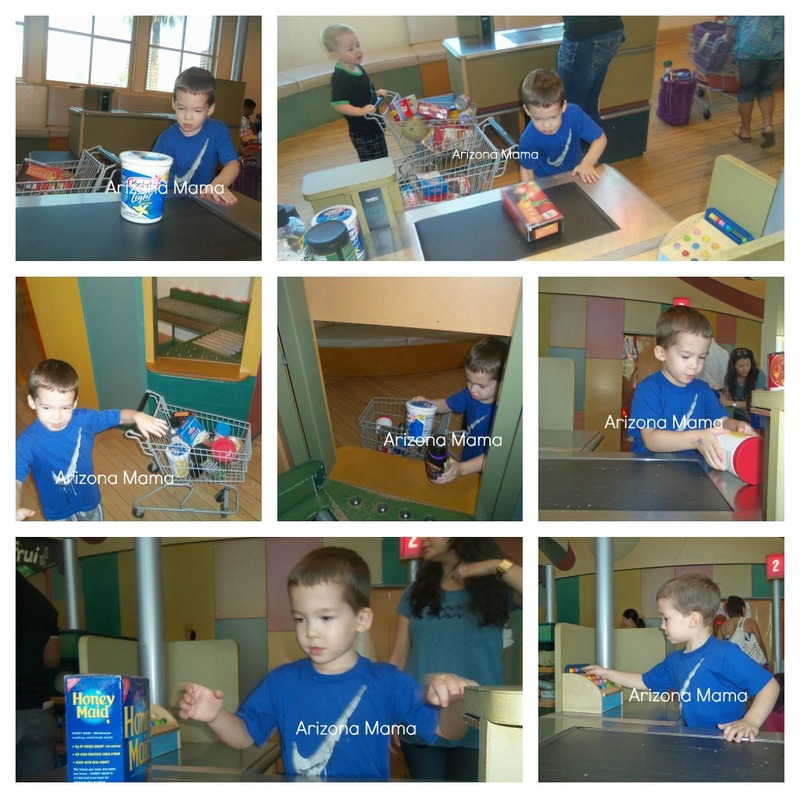 We moved on and found Aidan playing with the cars and race track. 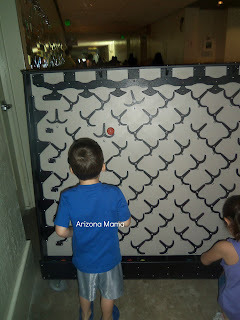 Jayden went slow by using the shorter track and later moved on to the larger track. 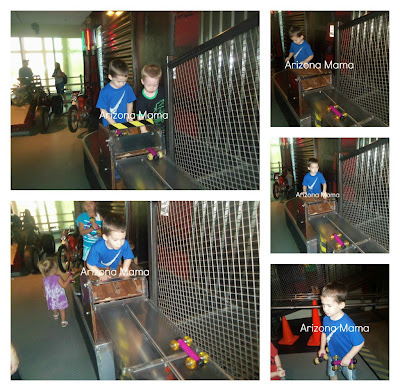 They had a great time playing and racing. We took a quick trip into the noodle forest and then stopped to have a little ice cream (fake of course). 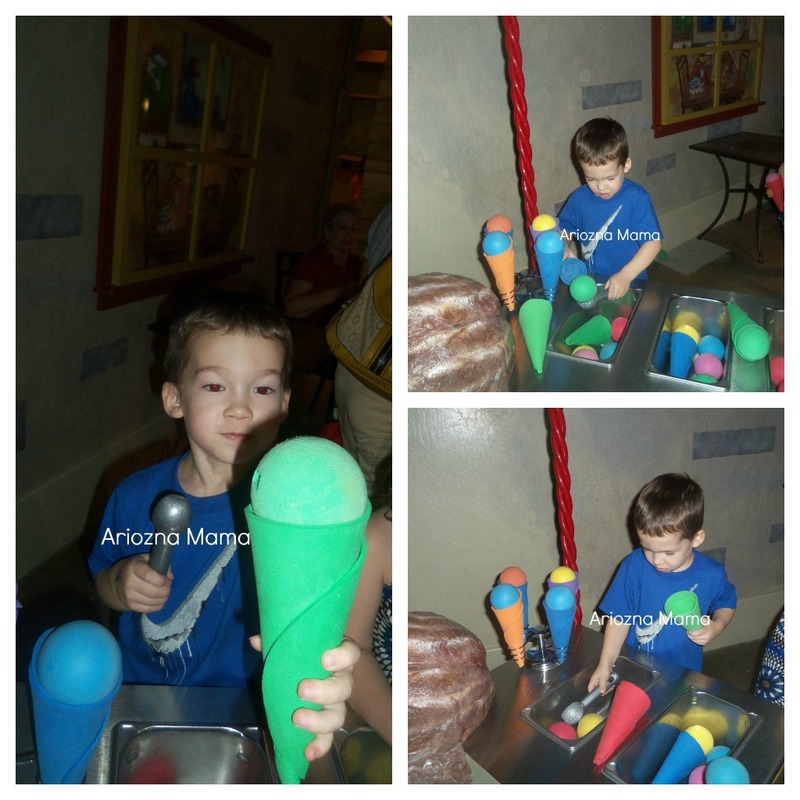 And our last stop we met up with Aidan again in the ball track room. Jayden started at the little golf ball track, but surprised me when he climbed up the loft and played alongside Aidan. Of course that meant that Chantel and I had to keep passing them balls to use, but it was fun. 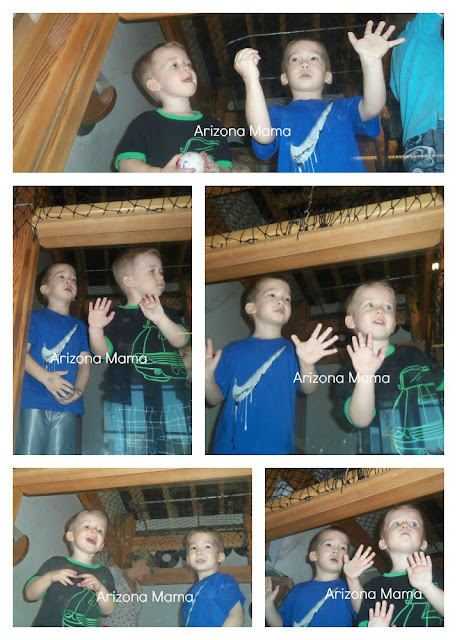 All these pictures are of the boys as they watched their balls circle the room along the ramp/tracks. They were so cute making faces as they watched the balls go around. 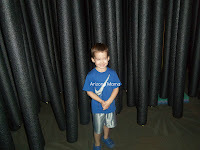 We had a great time visiting the museum and we can't wait to go back. Hopefully our next visit John can join us because although Jayden and I have been there a few times, John has never been there. 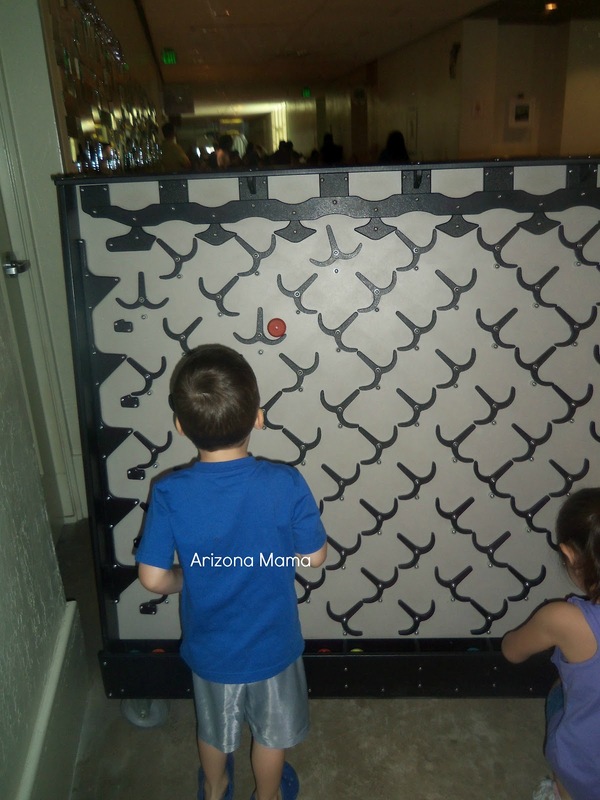 Thanks to my friend Chantel for gifting us this opportunity to visit the museum and play. Nancy, he is getting so big! Nothing like the pic at the top of the blog anymore! I need to take my boys to the children's museum here in Houston. I don't think we've ever been!